On the occasion of the meeting of the Presidents of Doctrinal Commissions under the Federation of Asian Bishops’ Conferences and the Congregation for the Doctrine of the Faith from 15 to18 January 2019 in Bangkok, I am pleased to be near you with my fraternal greetings. You are gathered in Asia, a vast and multifarious continent marked by religious, linguistic and cultural diversity, for the purpose of reaffirming our common responsibility for the unity and integrity of the Catholic faith, as well as to explore new means and methods to bear witness to the Gospel amidst the challenges of our contemporary world. In the Apostolic Exhortation Evangelii Gaudium, I invited the whole Church ‘to go forth’. 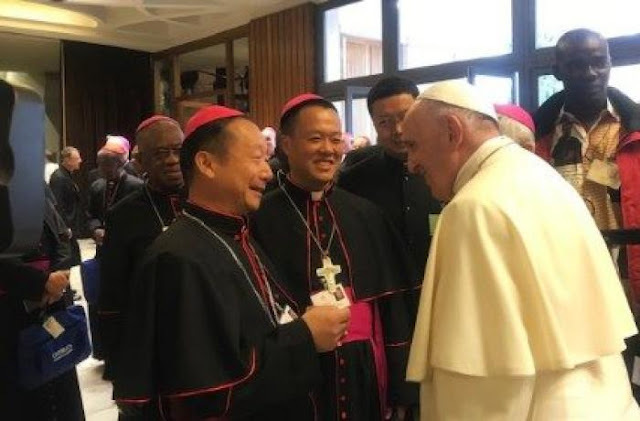 I am happy to know that the Congregation for the Doctrine of the Faith, taking into account the importance of the Episcopal Conferences and especially their Doctrinal Commissions, reaches out to the Pastors of the Church in Asia to foster effective cooperation and fraternal exchange. Praying that this meeting may offer an opportunity to address some concerns pertaining to the Gospel of Jesus Christ which are specific and relevant to Asia, I gladly impart my blessing to all the participants of this meeting. Vatican City, 10 January 2019.